A beautiful painting by the Italian painter Giovanni Antonio Canal (17 or 18 October 1697 – 19 April 1768), better known as Canaletto: “The Grand Canal and the Church of the Salute” (completed in 1730, Italian: Il Canal Grande e la chiesa di Santa Maria della Salute). It is a Rococo (or “Late Baroque”) landscape painting. The painting is oil on canvas and measures 151 by 121 centimeters (59.45 x 47.64 in) and is currently housed in a private collection. Giovanni Antonio Canal (17 or 18 October 1697 – 19 April 1768), better known as Canaletto was an Italian painter of landscapes, or vedute, of Venice. He was also an important printmaker in etching. He was a son of the painter Bernardo Canal, hence his mononym Canaletto (English: “little Canal”). He was very influential, famed for his precisely depicted and evocative views of the city (vedute). Canaletto’s early pictures for local patrons are his most accomplished: these carefully designed, individual, and atmospheric studies. He found that providing formulaic paintings for tourists was very lucrative. These, still highly skilled works, were produced by him often in collaboration with an organised workshop. Canaletto was favoured by English collectors. He visited England repeatedly between 1746-56, painting works like ‘Eton College’. His most important assistant was his nephew Bellotto, who became an accomplished artist. Canaletto often made meticulous preparatory drawings. He may have used a camera obscura for topographical accuracy in creating some of his designs, but he always remained concerned with satisfying compositional design, not simply slavishly recording views. 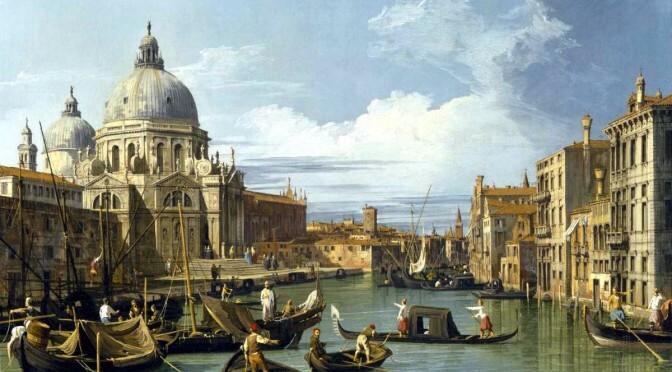 Canaletto’s views always fetched high prices, and as early as the 18th century Catherine the Great and other European monarchs vied for his grandest paintings. 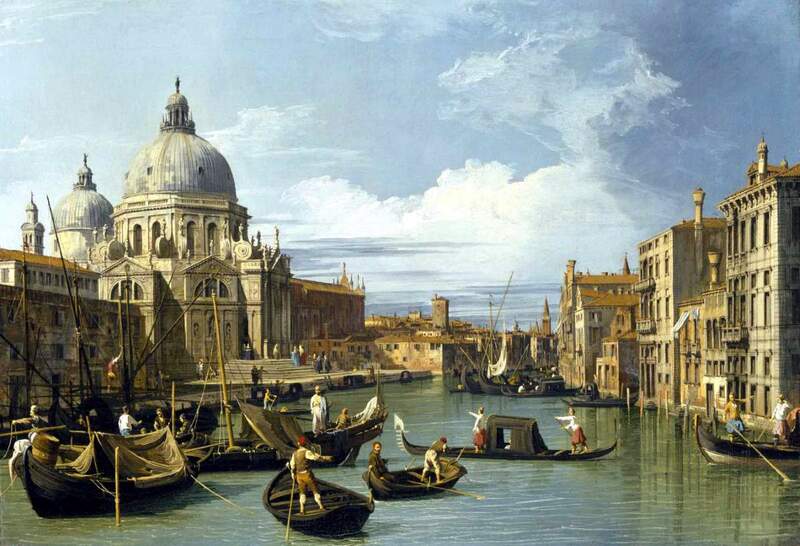 The record price paid at auction for a Canaletto is £18.6 million for View of the Grand Canal from Palazzo Balbi to the Rialto, set at Sotheby’s in London in July 2005. The Grand Canal of Venice. I took this photo in March 2009 from the Rialto Bridge (Ponte Rialto). The Grand Canal (Italian: Canal Grande, Venetian: Canałasso) is a canal in Venice, Italy. It forms one of the major water-traffic corridors in the city. Public transport is provided by water buses (Italian: vaporetti) and private water taxis, and many tourists explore the canal by gondola. One end of the canal leads into the lagoon near the Santa Lucia railway station and the other end leads into Saint Mark Basin; in between, it makes a large reverse-S shape through the central districts (sestieri) of Venice. It is 3.8 km long, and 30 to 90 m wide, with an average depth of five meters (16.5 ft). The Grand Canal probably follows the course of an ancient river(possibly a branch of the Brenta) flowing into the lagoon. Because most of the city’s traffic goes along the Canal rather than across it, only one bridge crossed the canal until the 19th century, the Rialto Bridge. There are currently three more bridges, the Ponte degli Scalzi, the Ponte dell’Accademia, and the recent, controversial Ponte della Costituzione, designed by Santiago Calatrava, connecting the train station to Piazzale Roma, one of the few places in Venice where buses and cars can enter. As was usual in the past, people can still take a ferry ride across the canal at several points by standing up on the deck of a simple gondola called a traghetto, although this service is less common than even a decade ago. Most of the palaces emerge from water without pavement. 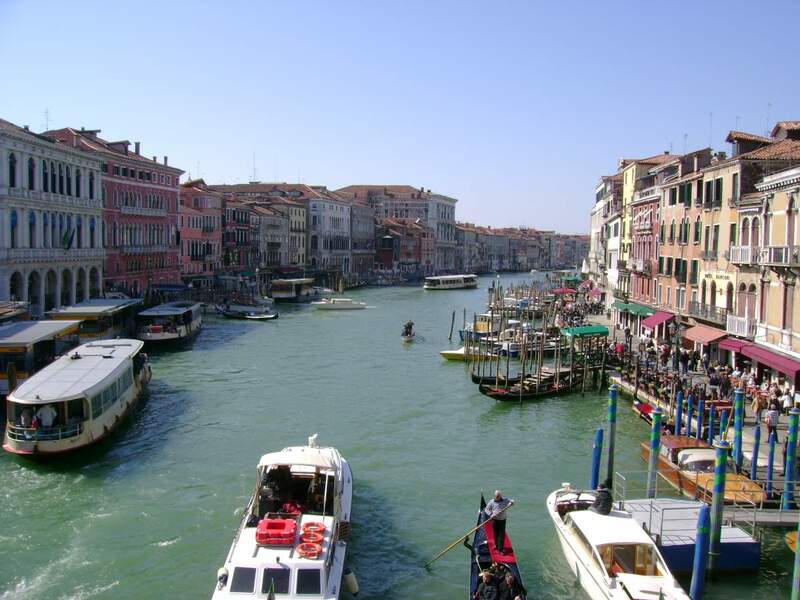 Consequently, one can only tour past the fronts of the buildings on the grand canal by boat. The Basilica di Santa Maria della Salute (Basilica of St. Mary of Health), commonly known simply as La Salute, is one of the largest churches of Venice and has the status of a minor basilica. It stands in a prominent position at the junction between the Grand Canal and the Bacino di San Marco on the lagoon. It is a Baroque church, groundbreaking was in 1631 and completed in 1687. The architect is Baldassarre Longhena (1598 – February 18, 1682 – Italian), who worked mainly in Venice, where he was one of the greatest exponents of Baroque architecture of the period. In 1630, Venice experienced an unusually devastating outbreak of the plague. As a votive offering for the city’s deliverance from the pestilence, the Republic of Venice vowed to build and dedicate a church to Our Lady of Health (or of Deliverance, Italian: Salute). The church was designed in the then fashionable baroque style by Baldassare Longhena, who studied under the architect Vincenzo Scamozzi. Construction began in 1631. Most of the objects of art housed in the church bear references to the Black Death. The dome of the Salute was an important addition to the Venice skyline and soon became emblematic of the city, inspiring artists like Canaletto, J. M. W. Turner, John Singer Sargent, and Francesco Guardi. Rococo, less commonly roccoco, or “Late Baroque”, is an 18th-century artistic movement and style, affecting many aspects of the arts including painting, sculpture, architecture, interior design, decoration, literature, music, and theater. It developed in the early 18th century in Paris, France as a reaction against the grandeur, symmetry, and strict regulations of the Baroque, especially of the Palace of Versailles. Rococo artists and architects used a more jocular, florid, and graceful approach to the Baroque. Their style was ornate and used light colours, asymmetrical designs, curves, and gold. Unlike the political Baroque, the Rococo had playful and witty themes. The interior decoration of Rococo rooms was designed as a total work of art with elegant and ornate furniture, small sculptures, ornamental mirrors, and tapestry complementing architecture, reliefs, and wall paintings. By the end of the 18th century, Rococo was largely replaced by the Neoclassic style. In 1835 the Dictionary of the French Academy stated that the word Rococo “usually covers the kind of ornament, style and design associated with Louis XV’s reign and the beginning of that of Louis XVI”. It includes therefore, all types of art from around the middle of the 18th century in France. The word is seen as a combination of the French rocaille (stone) and coquilles (shell), due to reliance on these objects as decorative motifs. The term may also be a combination of the Italian word “barocco” (an irregularly shaped pearl, possibly the source of the word “baroque”) and the French “rocaille” (a popular form of garden or interior ornamentation using shells and pebbles) and may describe the refined and fanciful style that became fashionable in parts of Europe in the 18th century. Owing to Rococo love of shell-like curves and focus on decorative arts, some critics used the term to derogatively imply that the style was frivolous or merely modish. When the term was first used in English in about 1836, it was a colloquialism meaning “old-fashioned”. The style received harsh criticism and was seen by some to be superficial and of poor taste, especially when compared to neoclassicism; despite this, it has been praised for its aesthetic qualities, and since the mid-19th century, the term has been accepted by art historians. While there is still some debate about the historical significance of the style to art in general, Rococo is now widely recognized as a major period in the development of European art. (Giovanni Antonio Canal) Canaletto – The complete works by Canaletto ECards, user comments, biography, slideshow, more than 580 images of paintings and more!